Not only are there many bridges crossing the Arakawa but there are also some interesting bridges alongside the river. The Katsushika Harp Bridge is an asymmetric cable-stayed bridge with tall and short towers that steps over the Ayase River to make room for the Nakagawa (see photo below). The Katsuhika Harp Bridge is a 455 m (1494 ft) long cable-stayed bridge (built by Kawasaki Heavy Industries) that carries the Shuto (Metropolitan) Expressway. It's a four span bridge with a 220 m (722 ft) main span between the two steel towers. 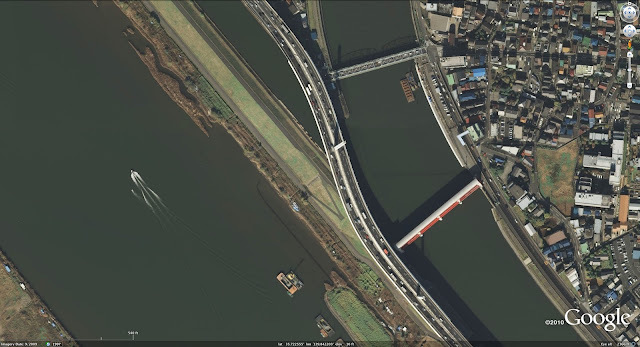 Tokyo, Japan's Bridges: Katsuhika Harp Bridge across the Arakawa by Mark Yashinsky is licensed under a Creative Commons Attribution-NonCommercial-ShareAlike 3.0 United States License.